With the addittion of the 'Blog Post Title Retrieval' feature to Haloscan's feed, I'm happy to incorporate the feature onto LastHalo. LastHalo's user who has had the post title retrieval feature turned on on Haloscan would get see the corresponding post title pops up when mouseover a link at LastHalo's sidebar. LastHalo now displays the corresponding blog post title if a user has enabled the blog post retrieval feature on Haloscan. LastHalo would automatically try to determine if a user has had the blog post retrieval turned on to prevent displaying of meaningless numerical post ID if a user has not enabled the blog post title retrieval feature. The foreign language special characters should now display correctly on LastHalo's sidebar. Optimization of LastHalo's code. LastHalo should now load faster than before. It now only needs a more stable server with a higher bandwidth quota to serve the increasing load. User can now view the most recent post title from LastHalo's Development Blog by mousing over the "Powered by LastHalo's" link. For new users, please refer to Installation Instructions. Attention: LastHalo's bandwidth has increased tremendously for the past few months. If the traffic continues to increase at the current rate, the author would not be able to maintain LastHalo soon solely from his own savings. Please help by donating to support LastHalo, especially if your site gets huge amount of traffic (> 500 visits per day). In exchange for your donation, the author is willing to provide the donor with a premium account when it is launched. On top of that, with the extra fundings, LastHalo would be able to be hosted on a more stable server with a higher bandwidth quota. I spent a lot of time incorporating Haloscan's latest feature - Blog Title Retrieval onto LastHalo with a nice mouseover popup using OverLIB. Only to find out that it messes up certain users' blog skins when I launched it. I had to take it down in order to save LastHalo's users' blogs' layout. If anyone has any suggestion on how I could present the blog title in a nice way without using OverLIB or any chance of messing up any current user's blog layout, please let me know. 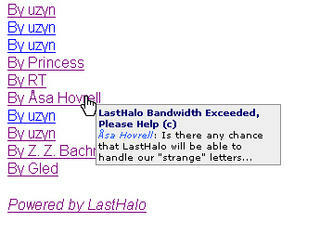 LastHalo's bandwidth has been exceed for the month of August a few moments ago. Although it's only a few hours away from September, hence a bandwidth coutn reset, I've increased LastHalo's bandwidth quota by a little to accomodate for the final few hours of the month of August. Sorry for those who have experienced some down time. However, I would like to let the users know that I would not be able to financially support LastHalo's bandwidth beginning the next month of so if LastHalo's bandwidth continues to increase at the current rate. Therefore, I would like to kindly request for donation from LastHalo regular users, especially those whose sites have thousands of visitors per day. It's a little something that you could do to help support this free service and to encourage me to further develop and improve this service. As a token of appreciation, if you donate USD 8 or more, I am willing to upgrade your LastHalo account to a premium account for a year, starting from the date when the premium account becomes available. As stated in my earlier post, the proposed price for a premium account would be USD 12 per 12 months, thus this would act as a token of appreciation of users who contribute to the early development of LastHalo. Please send me an email, to lasthalo@uzyn.com, if you are donating USD 8 or more, stating your Paypal user email, amount donated, your Haloscan username and your website (if you're willing to let me know). I would send you a thank-you reply and take down your name for the premium service. When the service becomes available, I would send you an email informing you about it and your login info. However, you are free to donate any amount you wish from USD 1 onwards. Every contribution counts. I would be highly grateful if you would donate. Last version update of LastHalo has been of months ago, I am sorry for my lack of updates for the LastHalo project as I have been rather occupied with my work and my studies. As I'm now working from home, I have more time now to resume the development of LastHalo. LastHalo free version would have a restriction on requests per day in the future. I'm sorry as I have to implement this restriction. It is unfair for most other users for certain high traffic blogs make thousands of requests per day, consuming a hugh chunk of bandwidth allocated for LastHalo like it is now. By being a premium member, you would be getting a much higher requests limit per day. More freedom to customize the codes. Premium users not only get to choose to display the list of comments in 'ordered' or 'unordered' form and specifying the prefix and postfix for each comment like it currently is, they get the freedom to customize every single lines of codes to be displayed. That means premium users would be able to insert customized HTML tags making the last comment list a drop-down menu or even a horizontal list. Ability to customize or even remove the acknowledgement line: "Powered by LastHalo"
Migration of LastHalo to a more stable server with high bandwidth quota. Anyway, this is the reason why I have to ask for donation - to pay for hosting fees. More to come as I can think of. Please email me for suggestions if you would like to request for a certain feature. Thank you very much for reading this post. Please donate to help me support this free service. I'm currently developing it and paying for the bandwidth from my own pocket money. I'm a university student and I'm working part time to support my daily expenses. Please donate if you have been using LastHalo for some time and would love to see LastHalo being continued. It would be sad to see LastHalo being taken down for my inability to financially support the hosting bills. Thank you very much for your support on LastHalo so far. I have been notified that Haloscan has added a Blog Title Retrieval feature to its feed. For those of you that have enabled the new feature, the current version of LastHalo has a slight problem parsing the feed, I would fixing it later tonight. Sorry about the delay. This would mean that for users who have enabled the blog title retrieval feature, they would get to display the blog title for the corresponding comment. Thanks Haloscan for implementing that.